I want to start out with a disclaimer. I have the absolute weirdest dreams ever. Really. If I were to share most of my dreams with y'all, you would totally think I was a crazy person. Last week I had another crazy dream. This dream was not only crazy but pretty scary. My first thought was to shake it off like all my other crazy dreams. But it stayed with me all day long. So I began to ask God to help me open my eyes to what I can learn from this dream. My family went boating at the lake with friends from our homeschool group. There were several different families aboard the boat and lots of teenagers. As we are floating along, we come across a cave. The teens wanted to explore the cave and the parents granted permission. Suddenly the teens come running out saying there are demons in the cave. At the same moment we see a house behind the cave and the people who come out of the house were worshipers of the devil and were screaming horrible things to us. This is scary to me. The lesson God showed me? Evil is everywhere. 1 Peter 5:8 says, "Be alert and of sober mind. Your enemy the devil prowls around like a roaring lion looking for someone to devour." And John 10:10 tells us, "The thief comes only to kill, steal and destroy." The enemy is after us people. He is trying to destroy us. 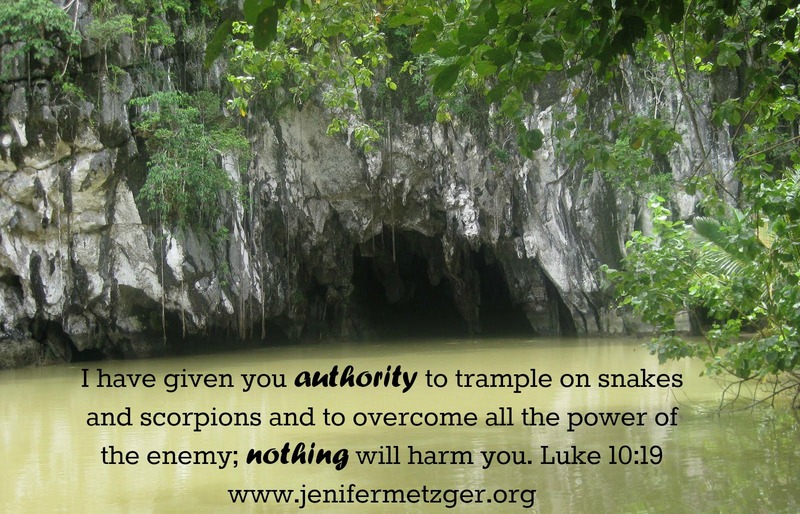 But Luke 10:19 reminds us, "I have given you authority to trample on snakes and scorpions and to overcome all the power of the enemy; nothing will harm you." The enemy might seek to destroy us, but God has given us authority over him! He cannot hurt us. Friends, be alert because the enemy will seek you out. But use the power God has given you and put the enemy in his place: under your feet! Wow! Sounds as if to me as if there may some work (attack) against the Homeschool group in the spiritual realm.. You are so right, the enemy does not want us to prosper in any way especially to those who are determined to ward against the worlds way of education and raising your children.. I definitely believe in being alert against the enemies schemes just as the Word tells us to. I believe sometimes our dreams are God's way of alerting us to what is coming. Be alert! Thank God you know who you are and Whose you are! We are more than conquerors and have all we need with the Lord.. Blessings! Patty, I agree. I have been in serious prayer for our group. We must be alert and prayed up. Blessings!